Editor’s note: We are very excited to announce the winners of the first of many Nadine Ohara “Best of” Wedding Contests. As you can see from this thread, Nadine’s passing was devastating to the community. 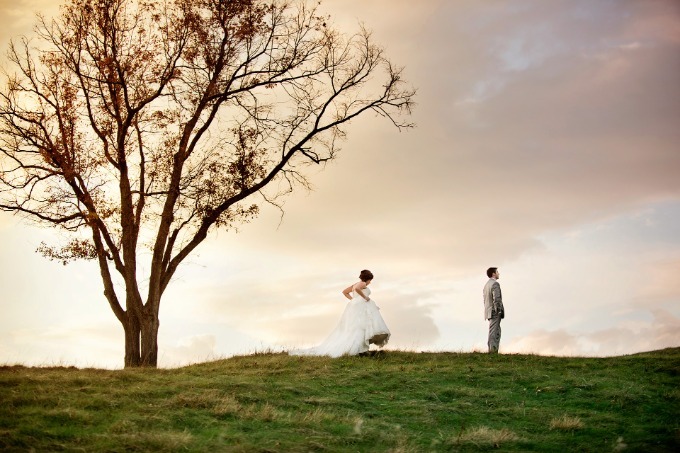 This contest allows members to have their favorite wedding photography featured and, in turn, it allows photo.net to donate to a super cause in Nadine’s honor. We are so grateful to William W for stepping into very big shoes as he took on the role of Wedding Forum moderator and for serving as co-judge for this special contest. We are also grateful to Kristen Booth, who is an incredibly talented and creative artist, for also serving as a co-judge. William is the Wedding Forum moderator on photo.net. 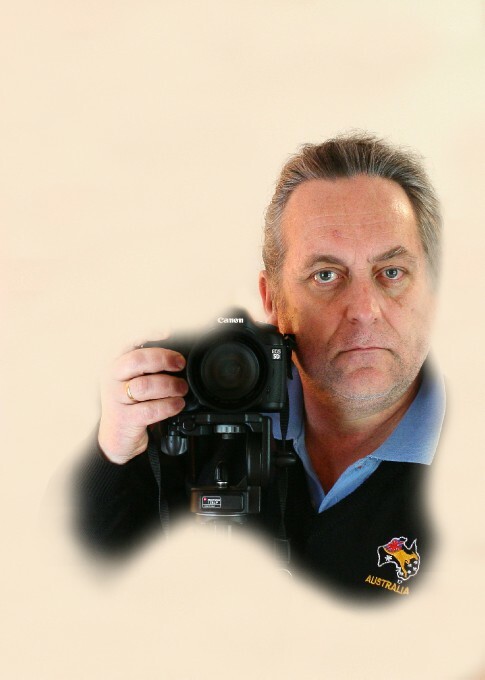 He has been a professional photographer for 30 years. His brief bio and also his photo.net portfolio is here. 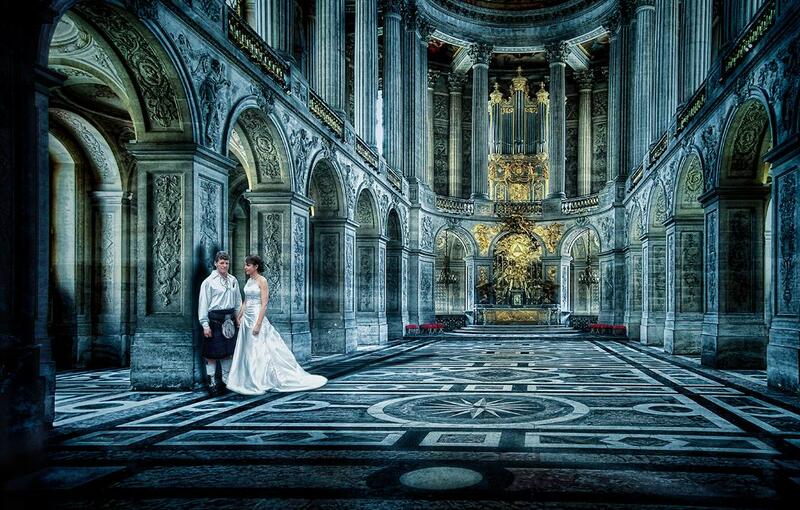 This first Nadine Ohara/Photo.net Wedding Photography Contest was one of the most difficult competitions I have judged. Firstly, the Judges culled the submissions to twenty Finalists against the Criteria. Then, those twenty final images were individually scored by each Judge out of a maximum of 300 points against the Judging Criteria. Finally, the two Judge’s scores were then added to provide the 1st, 2nd, and 3rd placing. After three weeks of individual scoring, the result was a four-way tie for second place. This is exceptionally unusual when using a scoring system based on a possible “perfect 600 points.” It then took a couple of weeks for detailed discussions to take place and then two rescores resolved the four-way tie. The fact that it too so much work to come to a final decision is a testament to both the quality and variety of the work presented in this inaugural competition. The caliber of entries is a befitting way to remember the professionalism of Nadine Ohara. 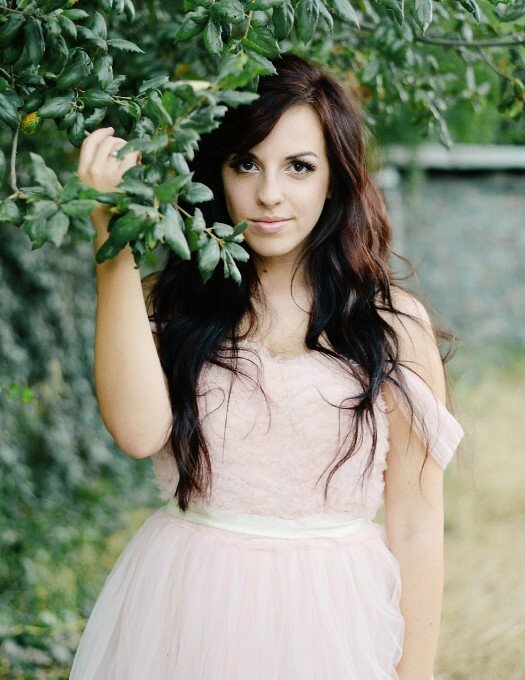 I wish to thank Kristen for the time, work, and talent she brought to the judging of the competition. Her passion for the Craft was palatable in our correspondence and her professional discourse and creative insights ensured a balanced, tempered, and even judging process—across the multiplicity of levels—within the criteria we had to consider. I also wish to thank all contributors and the forum for being patient whilst we took that extra time to allow due diligence to the judging process. Kristen: What initially drew me into this photo was the intimacy. 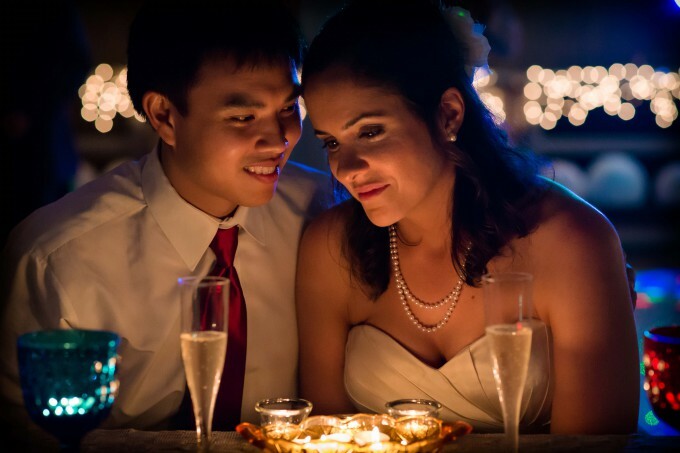 The ambient lighting, focal length, “posing” and expression all come together to create a feeling of romance. I can’t see a better way for this sweet moment to have been captured. Astounding! William: The tension / submission juxtaposition seeped through when I first looked at this image. Technically, the Depth of Field was managed very well and the available light picked catch-lights in both Subjects’ eyes. The blue rim light works and the Bokeh is magic. Certainly a very personal moment captured. The more I look at this image the more I see in it. An outstanding example of Available Light Portraiture and also capturing the moment. Kristen: I love the feeling of anticipation as you see the bride approaching her groom. The subjects standing out off of the horizon line, combined with the dreamy clouds, is absolutely breathtaking. Excellent execution of a special moment. 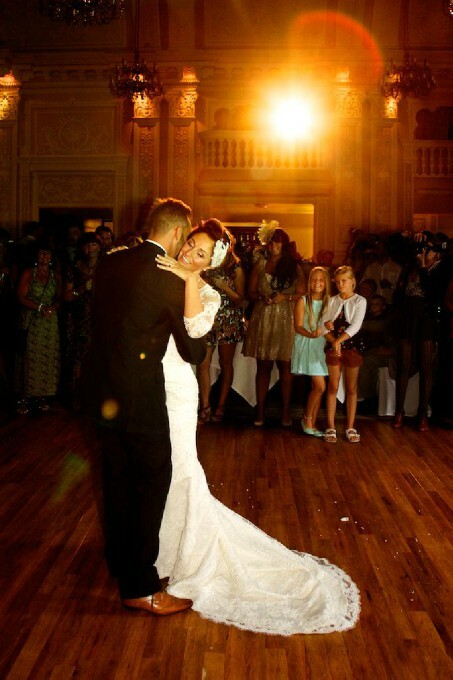 Kristen: Every element of the photo serves the purpose of leading your eyes to the blissful newlyweds. 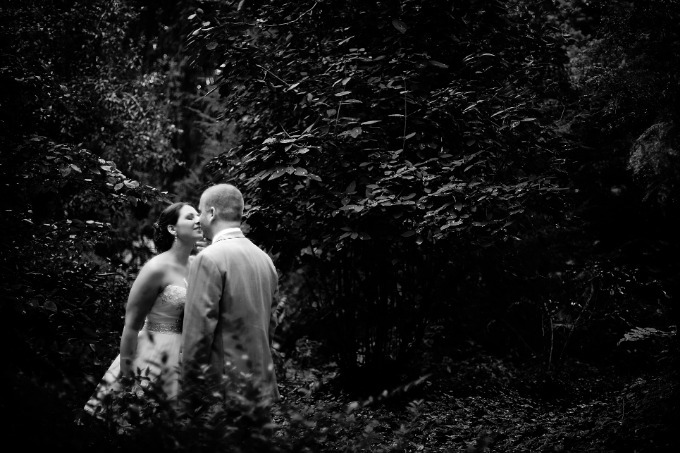 The dramatic black and white is a perfect way to execute this capture of that “just-before-the-kiss” moment. Fabulous exposure and great use of thirds. Lovely! William: The use of the natural lighting; the story being intimate and immediate; the composition though formal is entirely suited to the image’s structure; the suggestion of (or actual) movement of the Subjects toward each other — are all elements which make this capture top class. The choice to render in Black and White, adds. Kristen: This photo represents what it is to be madly in love. I love how he is sweeping her right off of her feet and the connection and pure bliss they exude as they press their faces together. Great depth of field and choice of black and white. Simple, timeless, and genuine. Kristen: Wonderful composition and color. 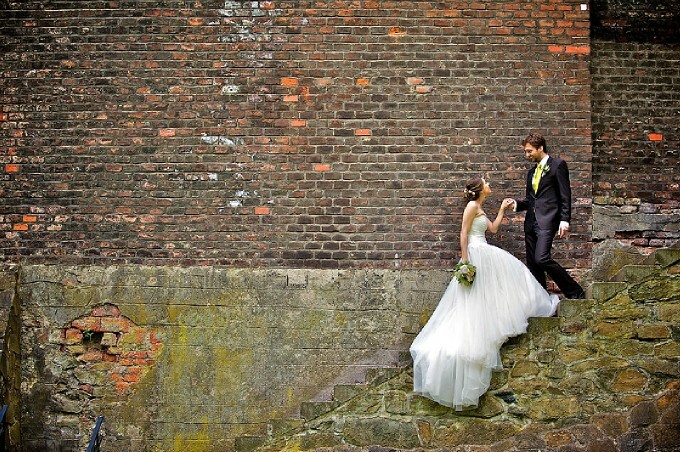 The heavily textured background draws your eyes to the subject and the vivid white gown. I love the little extra touches in this photo. The bride’s train flowing down the side of the structure, the groom taking a step down to approach her, their hands holding ever so gently. Well done. William: Excellent control and balance of Flash and perfect execution of Dragging the Shutter. Excellent control of the Wide Angle Lens. Poignant capture of both story and moments of the Bride and Groom and also the Congregation, especially the two young Girls. William: Big capture, intense. An excellent example of personal style and imagery to underscore “Wedding.” Excellent Line, Perspective, Composition and Photo Finishing all serving to enhance the Artist’s vision. 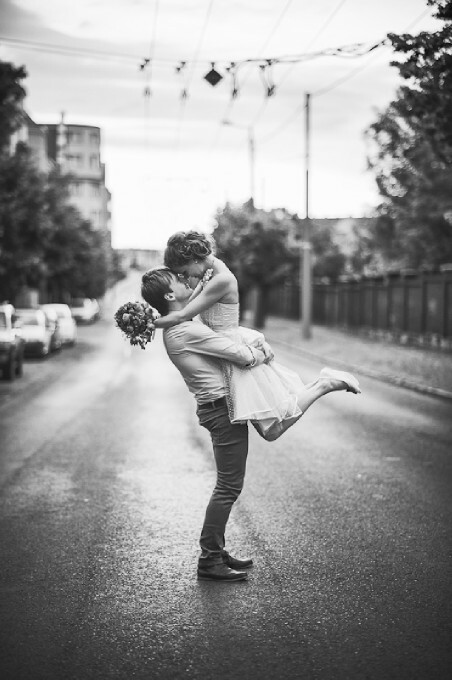 Stunning example of a particular genre / style of Wedding Photography. Thank you to all of you who participated. Each submission = $1 for The Magic Hour Foundation and the 1st, 2nd, and 3rd place winners will each receive a commemorative plaque. We can’t wait to see your submissions next year! To view all submissions, please click here. CONGRATULATIONS TO THE WINNERS. I know that Nadine would be delighted to see such GREAT work done by photo.net photographers! What a wonderful idea! Thank you William and Kristin! I haven't been on PN much in a few years but looks like I've been missing out. Beautiful tribute to Nadine and excellent work by the finalists and winners! Great photos! All the winners are well deserving. Thank you for Honorable Mentions! I am honoured to be in the company of such a great photos. What a great way to honor an amazing person. Thank you so much Kristen and William for donating your time and talent to judging this contest. And congratulations to the winners! I'm honored to be in such fine company.